to do him a courtesy. I pray God to receive my ham. I lay all night with my marrow bone. 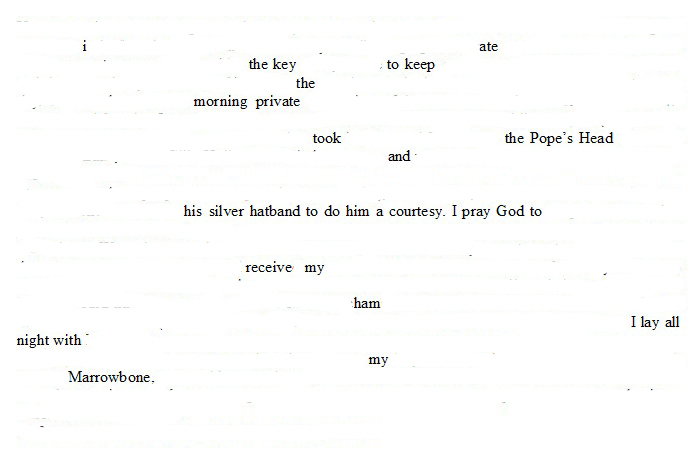 Erasure poem derived from The Diary of Samuel Pepys, Thursday 22 March 1659/60. I love ‘I ate the key to keep the morning private’! Thanks! I liked that too, and was a bit annoyed with Mr. Pepys for not giving me the words to expand that thought in the direction I wanted. This erasure business is a continuing exercise in humility. Like this one very much! I came across your blog on Diane Lockward’s blog list. I will keep visiting. The title of the blog drew me in. Hi Anne — thanks for visiting. I’m glad to hear that “Via Negativa” drew you in. I think it scares a lot of people off, too! Well, thank you! Glad to make your acquaintance. where is my marrow bone? It’s connected to your butternut bone.